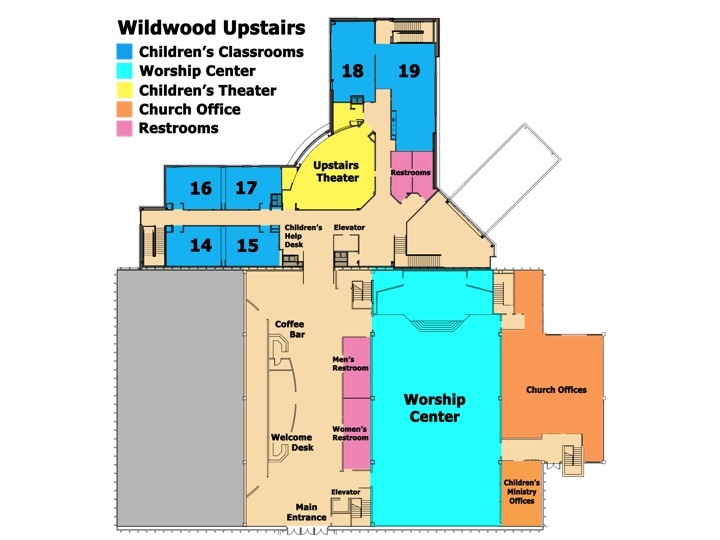 Welcome to Wildwood Community Church! When you are visiting a new place with new faces, sometimes it’s a challenge to make yourself at home, or feel the freedom to look around and check things out. At Wildwood, we want to encourage you to look around and feel at home. We want to be an inviting spiritual home for all who come through our doors. Should you have any questions we encourage you to ask the Welcome/Help Desk located at our primary entries. In addition, you can ask anyone wearing a “Welcome Team” name tag. They are there to serve you. We look forward to the opportunity to connect with you and your family as together We’re FOR following JESUS together to the glory of God. We have two identical services at 9:45 am and 11:00 am in the Worship Center that feature contemporary styled music and teaching grounded in Biblical truth. Additionally, we have support programming for children (birth – 5th grade) running during both services. Our Student Ministry (6th grade – 12th grade) meets during the 9:45 service. Adult classes meet during both the 9:45 and 11:00 hour. *Maps are available at the Welcome and Help Desks as you enter. The main entrance is through the glass doors on the upper parking lot. After entering, you will find the Worship Center on the right just inside the doors. As you enter feel free to stop by the welcome desk if you have any questions, or join us for a cup of coffee just down the hall. We have parking spots available in two lots on the upper level leading to the gathering hall and worship center, and a lower lot leading to the entrance of the children’s building. For those with elementary or below age children, the lower lot provides an easier transition to the children’s check in area. We provide Sunday morning classes for all adults during the 9:45 and 11:00 hour. Small Groups, the Bible Institute, women’s Bible studies and breakouts are available during the week as well. We have ministries for children of all ages including Preschool (birth-preK), Children (K-5th grade), Middle School, and High School. 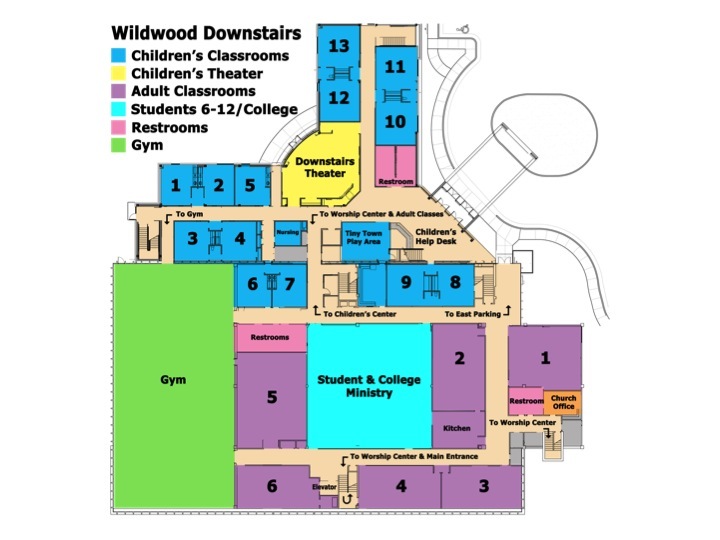 Our preschool and children’s areas host classes during the 9:45 and 11:00 hour and use a computerized check in system. If you would like to expedite the check in process, you can download the Family Registration Card here. We have unique programming for middle and high school students during the 9:45 hour each week. Middle school meets in the Fellowship Center and high school students meet in room 5 (called the Avenue.) During the other service (11:00), middle and high school students are encouraged to attend the main worship service with their parents or serve in one of our ministries. College Students are invited to join the church family in worship during our worship service at 11:00 and then stay for FREE lunch after in the Fellowship Center. This allows college students to be part of our Wildwood family and then gather together for lunch and Bible Study. For more information about Wildwood’s College Life Ministry CLICK HERE. We have ministry for families with children with special needs. This ministry is currently offered during the 11:00 worship service in the children’s area. In order to supply quality and appropriate care, this program requires a meeting with the special needs team coordinator and a parental questionnaire. Please contact the church office regarding entrance to this program at 405-329-3939.